Cute teen boy programmer working at a computer in the data center filled with display screens. Portrait of Child prodigy hacker. 4k00:33Cute teen boy programmer working at a computer in the data center filled with display screens. Portrait of Child prodigy hacker. 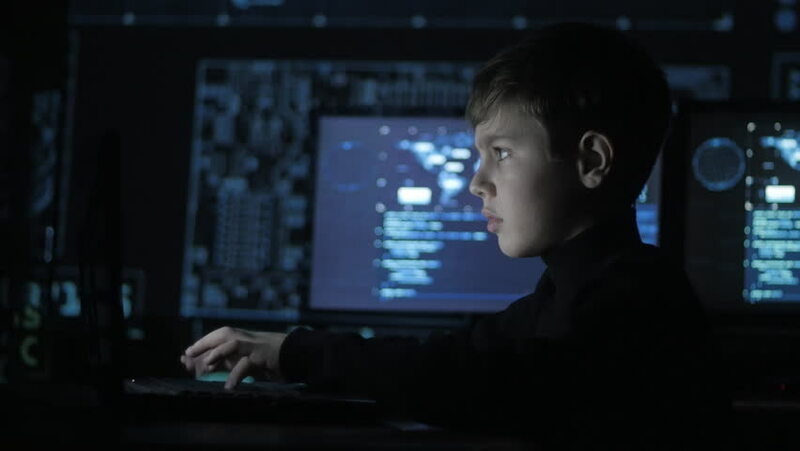 4k00:29young prodigy boy hacker programmer working at the computer in the data center filled with display screens. Portrait of Child prodigy hacker. 4k00:28Hacker programmer in glasses is working on computer while blue binary code characters reflect on his face in cyber security center filled with display screens. 4k00:23young prodigy boy hacker programmer working at the computer in the data center filled with display screens. Portrait of Child prodigy hacker. 4k00:41Cute teen boy programmer working at a computer in the data center filled with display screens. Portrait of Child prodigy hacker. 4k00:15Cute child prodigy developing app. Cute kid young programmer working on computer at data center. 4k00:14Cherkassy, Ukraine, January 04 2019: Hacker hides his face behind the mask of Guy Fawkes in dark room filled with display screens. 4k00:36young prodigy boy hacker programmer working at the computer in the data center filled with display screens. Portrait of Child prodigy hacker. 4k00:15close up portrait of little boy looking at camera. He is happy and smiling. 4k00:37close-up of child playing a video game on the console. The projection of the game on the face and on the wall. Double exposure.